Danube Propeller is a not-for-profit association founded in 1988 by IWI Council member Krsta Pašković, who has been energetically campaigning for almost 30 years for development of the nautical tourism potential of the Middle Danube region. The association co-organised the forum ‘Danube – River of Cooperation’ in Belgrade in 2003, attended by a delegation from IWI. Several presentations underlined the potential not just in Serbia but in all the adjacent countries with navigable access through the river Danube or its tributaries. 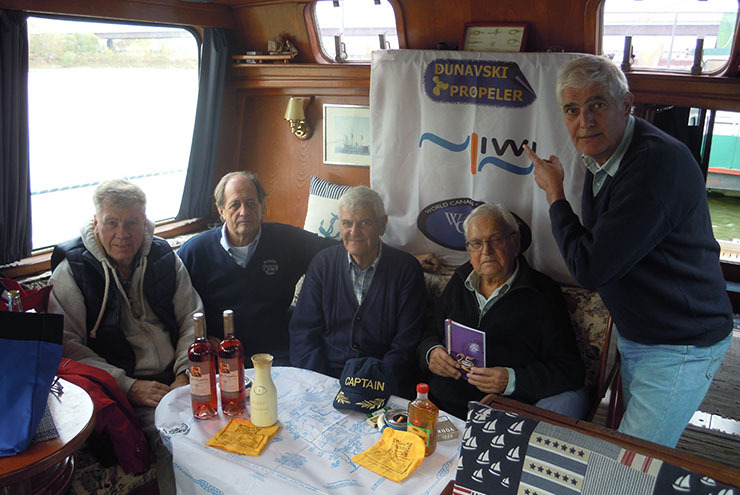 This was one of many initiatives by Danube Propeller, which has also attended many boat shows in Belgrade, London and Paris, and co-hosted the World Canals Conference in Novi Sad in 2009. Krsta Pašković has also actively promoted the adoption of UNECE Resolution #52 in favour of international recognition of recreational waterways. Applying international standards for design, construction and equipment of harbours and recreational craft could be the key to creating many jobs on the 3500 km of navigable waterways of the Middle Danube region. Danube Propeller regularly collaborates with EBA, ICOMIA and Transmanche Publications, and Krsta Pašković is also a member of TICCIH and one of the ‘Blue Links’ group of experts advising on the Canal de Roubaix restoration project in France. A new web site is currently under development. Danube Propeller meeting on the Sava river in Belgrade. From left to right: Djordje Radovanović, founder Krsta Pašković, Zoran Radmilović, Rade Ječinac and Milan Isaković.